Blush has been one of my favorite colors for many years. In fact, it's one of the only colors I truly like, and I couldn't be happier that it has found it's way into the popular circle this season. I love how blush adds a softer, more feminine, feel to my other favorite color, black, and together, the two colors make the perfect power couple (fashionably speaking). When I saw this dress on the Chicwish website, I knew I needed it in my closet immediately. The stripe sleeves and the bow tie detail add a fun layering effect, not to mention the sweater-like material is very comfortable. I finished my look with tights and little booties giving this dress a slightly mod feel. Although I have to admit, I was freezing after taking these photos so I threw on a pair of skinny jeans, and ended up loving this dress styled as a tunic. Does everyone have fun plans for the weekend? I'm headed back up to the lake to spend time with my sister and mom, and I couldn't be more excited! Wishing everyone a great weekend, and thank you for reading! I'm loving blush pink right now too and that dress is gorgeous! I love it styled with the stripes! Such a pretty look! Thanks for the linkup! I also can't get enough of layering tunics this season - and this look is a winner!! Happy weekend!! I could not love this outfit more!! Very Mad Men! This dress is too cute! 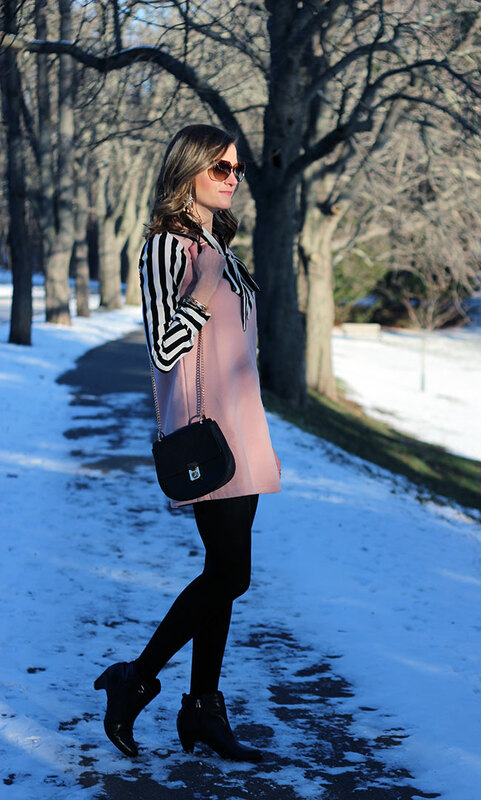 I love the combination of blush and stripes. That dress is stunning. Love hat it looks like a two-piece. I love blush too and hey Rose Quartz is the color of the year! I love your coat and earrings too. Your photos look so beautiful by the snow. Melissa is looking great today with her animal print black+white top and burgundy pairing. Thanks for the linkup. Beautiful! Love this ladylike look! I simply love your outfit! It is classic and ladylike. Bush,black, and white are a great color combo. Oohhhh I so almost ordered this but I was afraid it would be too short on me. I love seeing it on you. You styled it just the way I would have. The pink with the stripes is just too good. Have a great weekend! Love the striped shirt layered under the dress - great way to wear it in the cooler weather :) It is a very nice shade of pastel pink too. So pretty! The dress looks perfect with that striped top!